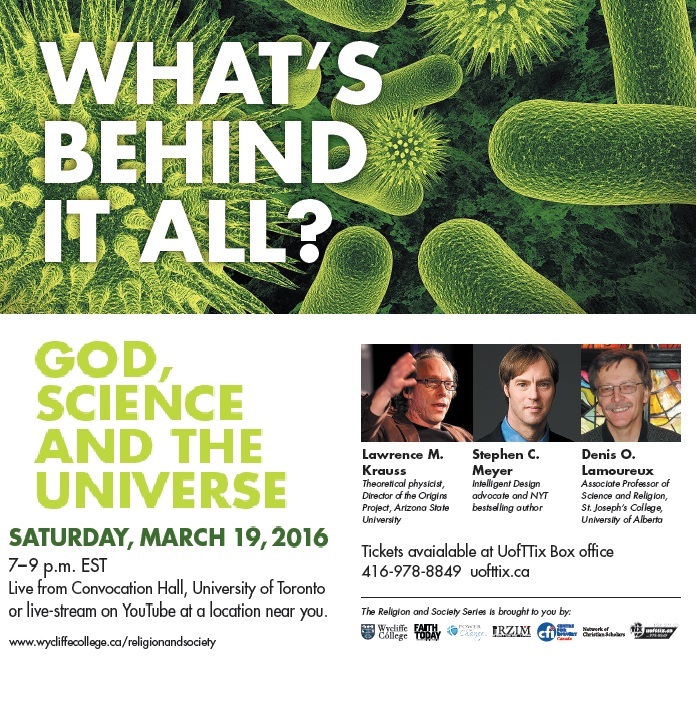 It was not the ideal of a clash between ID and Lawrence Krauss’s atheism that one would hope for. However, the event was something else, in a way, of no less interest. It was a dramatic test and acting out of character. Almost as if it had been intelligently designed that way. Meyer’s courageous performance, while not his most articulate, was in a moral sense heroic. When all was said and done, Meyer with a migraine offered a whole lot more substance than either of his interlocutors. In addition, he was a gentleman throughout. His argument was about science and nothing but science. He never stooped to slander or condescension. Krauss opened with a vicious and dishonest attack on Discovery Institute (“rather moribund right-wing creationist group”) and on Steve personally, emphasizing themes of pushing ID into public high schools (which Steve and Discovery have always opposed) and the Dover decision. Presumably because Krauss isn’t conversant with the biology behind the argument for ID, he relied on the critique cribbed by Judge Jones from the ACLU. More. But David, that’s who Krauss is. Krauss is a product of his times. Here’s Krauss whining about his encounter with William Lane Craig (2011). But that sells. Denis Lamoureux was not my cup of tea. Unlike Meyer, who made no appeal to personal religious experience, Scripture, or theology, because he doesn’t need to, Lamoureux offered history, theology, simplistic Scriptural exegesis, biography, autobiography, personal belief, ancient mythology and poetry, with a splash of dental evolution. Lamoureux included on one of his slides the contention that he personally has experienced miracles. Some, though not all, theistic evolutionists share a certain fulsome, unctuous manner, almost a signature style, when it comes to dealing with their own religious beliefs. He said, “Steve is a friend. Steve is a brother in Christ,” “I’ve prayed with Steve,” “I don’t want to do this but I have to do it.” Yet the same Christian brother, who whistles through his teeth when he talks, spent much more energy in attacking Meyer than he did in attacking Krauss. He encouraged the atheist by exclaiming at one point, “Preach it brother!” and assured the audience “I resonate deeply with Dr. Krauss.” Yes, it seems so. Well, brother Klinghoffer (my sometimes editor is an observant Jew [ 😉 ]), most folk in Canada who take the ID controversy seriously, regardless of their perspective, left Lamoureux and his colourful testimonies on a siding in the wilderness some time ago. His schtick goes down way better with Christians who are slowly thinking their way away from Christianity toward naturalist atheism. After all, there is no essential difference between “theistic” evolution and metaphysical naturalism (nature is all there is). Please consider: There would be no debate but for Meyer. His migraine was support staff. While he was disabled, the others capered on, unable to get past vitriol or testimonies and deal with the issues around design. That is where we are now. See also: At Forbes: Dump the term “theistic evolution.” No essential difference between “theistic” evolution and metaphysical naturalism. If I might suggest … the Royal Society was founded a century prior (1660) to Darwin, and the Darwinian evolutionary theories’ promoters, initiated by Thomas Huxley, were called the X Club. The X Club began in 1864 with the well known emphasis … “devotion to science, pure and free, untrammelled by religious dogmas.” Darwin was a member of the Royal Society but his work did not directly and immediately alter the Society’s culture. The X Club, approximately nine natural philosophers holding nontheistic positions, formed separately with the intent of transforming the Royal Society into a philosophical naturalism organization. Krause reminded me of Steve Tyler & Mick Jagger. Clowns dancing around a stage waving arms (and hips). The arrogance and struting. Krause is an example of a credentialed scientist who gives a bad name to credentials. His “opinions” are meaningless and show his true character. At least Tyler & Jagger could sing. My apologies … “a century prior” should read “two centuries prior”. If Krauss had walked on stage with a top hat and high heels to reach Meyer’s height, instead of the Fedora and sneakers which he did wear, he would have looked just as imbecilic as he sounded. Thanks for correction, Rex Tugwell at 1, now made. Come to think of it, if Darwin’s friends had founded the Royal Society, it might sound more like the Darwin in the Schools lobby today. If the RS 😉 is not a mere Darwin franchise, it may well corporately think it has a brand to protect. Krauss didn’t just attack the DI but said creationists were doing child abuse in pushing creationism in schools. Some of the audience applauded. on behalf of cAnadians they don’t speak for canadians. It is typical Canada that the evangelical was not a accurate sample of canuck Evangelicals. WE are YEC to the core. You be a evangelical Christian and say the bible is not true where you decide its not true. Yet it doesn’t make sense and how does he know. He has a thing in Dentistry and so that explains a lot eh. Glad for the thing but they to be better. Krauss lost all credibility to thinking people who are interested in origin science. Meyer is good for his stuff but they need a YEC to really raise everything.